Were you in Bryant Park yesterday? Did you happen to imagine that you sniffed a very slight whiff of smoke? 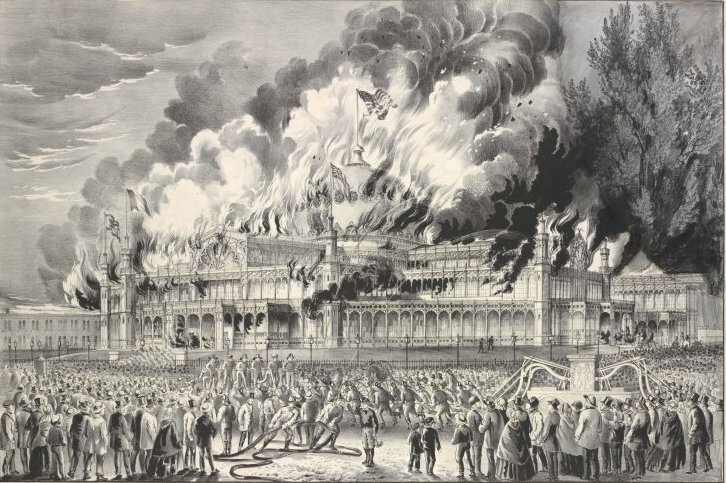 It was just a ghostly reminder of one of the most famous fires in all of New York history — the destruction of the legendary Crystal Palace exhibition hall, which sat here for five glorious years until its consumption in flame on October 5, 1858. One of New York’s most spectacular and famous buildings (modeled after a similar structure in London), the Crystal Palace housed the marvels of American technological might for display, a glimmering temple to the industrial age. Some historians speculate that the Crystal Palace was the first American building to be photographed. Inside, one could find the a model of the first operating elevator here, or cable wires that would later be used with success on the Brooklyn Bridge. And to the area before fire safety. Amount of time it took for the Crystal Palace to be entirely destroyed? Twenty-five minutes.